I reviewed the first novel in the “rebooted” Pretender series a few days ago. Now I’ve read the second, and I’m equally – or more – disappointed. The old Pretender TV series (which I loved) concerned Jarod, a young man, a genius able to absorb knowledge fast enough to become anything he wishes very quickly. He was raised in a scientific laboratory where he was used to test out scenarios for various customers, some of them pretty evil. Then he escaped. Now he was going around looking for cases of cruelty and injustice, and setting up the bad guys for exposure and punishment (usually the legal kind). The literary reboot, written by the series’ two head writers, alters that formula a tad. Jarod is the same, and his chief opponents – Sydney, the closest thing he has to a father, and Miss Parker, a miniskirted attack dog who’s half in love with him – are pretty much the same. But Jarod is taking on bigger challenges now. In the first book, Jarod helped a few people incidentally, in service of his greater goal, rescuing a kidnapped boy named Luke. Luke was taken by terrorists in order to pressure his father, an engineer, into committing a major act of terrorism (I’m not sure it’s ever explained what the terrorists’ actual political or financial goal is). Luke was not rescued at the end of the last book, so The Pretender: Saving Luke finishes that story. I liked spending time with Jarod, although this Jarod is a little more coldblooded than the TV one. He does some pretty cruel things to people in pursuit of his goals. Granted, they’re bad people, but that kind of ruthlessness does not build reader empathy, unless the reader is a psychopath. Also, the plot is (to my mind) just too big. A big terrorist plot, a ticking clock, and heroics that frankly pass credibility. This is a superhero story, kind of like Batman. I don’t go to The Pretender for a superhero. Also, the writing hasn’t improved: awkward sentence structure, confusion of words – imminent/eminent, rappel/repel. The book really, really needed a copy editor. 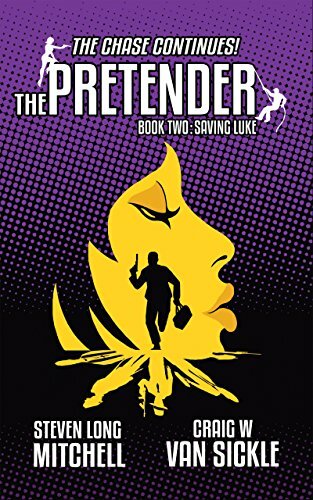 I’m not sorry I read The Pretender: Saving Luke, but it missed the bullseye for me. Also, there seemed to be more transsexualism and lesbianism than strictly necessary. Cautions for a little rough language and sexual situations.